Stanton stands in Homewood's Glass Pavilion in an undated photograph. Phoebe Stanton, an outspoken guardian of Baltimore's architecture and an art history professor emerita at Johns Hopkins, died Sept. 24 at Union Memorial Hospital of complications from heart disease and emphysema. She was 88. A memorial gathering will be held at 11 a.m. on Wednesday, Oct. 8, at the War Memorial Building on City Hall Plaza. 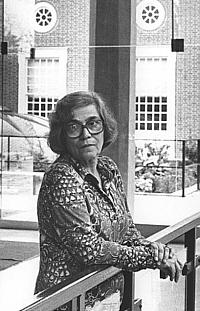 Stanton moved to Baltimore with her husband in 1954, began lecturing at Johns Hopkins that same year and spent decades shaping both the skyline of her adopted city and the lives of her students. Hopkins alumna and Butler, Md.- based architect Ann F. Hagerty described Stanton as a "guiding force." "In my senior year, I decided at the last moment to pursue architecture," Hagerty said. "I asked Phoebe if she would support me, and she said yes, because if she were to do it all again, she would be an architect." After losing touch with Stanton, Hagerty contacted her again in 1995 for counsel on moving her New York City firm to Baltimore. Stanton met with her former student and dispensed advice just as she had 20 years before, Hagerty said. "[She gave] that extra touch that gets you where you need to be, and I only hope I can do the same in some way for the next generation. In addition to her guidance, her energy in the field was equally inspiring. She demonstrated that women were not only needed, but if they believed in their message, they would be heard." Over the years, city planners heard plenty from Stanton, recently described by Sun architecture critic Edward Gunts as Baltimore's "design conscience," "a tireless public servant" and a tough critic with a soft side. She joined the city's Commission for Historical and Architectural Preservation in 1963 and began serving on Baltimore's Design Advisory Panel in 1970, attending what would be her last meeting in June. Over 33 years and through the terms of four mayors, Baltimore boomed under her watch as redevelopment swept the city, Gunts wrote. "She could be crotchety, irascible, tart-tongued with presenters, calling a building 'dreadful' or 'horrid' if it were deserved," Gunts wrote. "She could get caught up in the poetry of a design, as she did with the swirling curves of the American Visionary Art Museum. Either way, for 33 years she was a brilliant and passionate champion of the city, continually exhorting architects and landscape architects to do better. And every once in a while, they did." In addition to her architectural advisory board memberships, Stanton was an architectural critic for the Sunday edition of The Sun from 1971 to 1976. She also authored several articles and two books, The Gothic Revival and American Church Architecture: An Episode in Taste 1840-1856, published in 1968 by the Johns Hopkins University Press, and Pugin, published in 1971 by Thames and Hudson. From her start as a lecturer in the History of Art Department, Stanton moved through the ranks and was named the William R. Keenan Jr. Professorial Chair of the department in 1971. She retired from the university in 1982, but her spirit continues to foster the growth of Hopkins students through the Mattin Center. "[Stanton's] Intro to Art History survey course was formative and created in me a lifelong passion for the arts," said Johns Hopkins alumna Christina Mattin, whose commitment to a student arts center made the facility a reality. "Over the years, my interest in the arts grew, and I have visited countless museums. I became more convinced of the importance of the arts in a comprehensive education." Born Phoebe Baroody in a suburb of Chicago, Stanton earned a bachelor of arts degree from Mount Holyoke College in 1937 and a master's degree in modern European history from Radcliffe College in 1939. Her graduate studies at Leland Stanford University were interrupted by her wartime employment with the Navy and the Board of Economic Welfare. She earned her doctorate in 1950 from the University of London and worked at the American Embassy in London for three years before moving to Baltimore. Through the years, she also taught at Reed, Bryn Mawr and Goucher colleges. Stanton is survived by a son, Michael Stanton, chairman of the Department of Architecture and Design at the American University of Beirut. Her husband, Daniel J. Stanton, who died in 1966, was a planner and urban renewal administrator. GO TO OCTOBER 6, 2003 TABLE OF CONTENTS.